Before the advent of RERA in Maharashtra, the promoters or the builders indulged in malpractices that exploited the buyers in many ways. The dawn of RERA 2016 appeared as the beacon of light. RERA is the most beneficial and laudable step taken by Central Government to the plight of homebuyers. MahaRERA was one of the only few state authorities to come up with a website in the Act’s initial phase of implementation. Maharashtra was one of the few states ready to implement RERA immediately after the Act was notified. The real estate regulatory Authority of Maharashtra is also responsible for carrying out RERA registrations in the territories of Dadar and Nagar Haveli and Daman and Diu. Before the advent of RERA in Maharashtra, the promoters or the builders indulged in malpractices that exploited the buyers in many ways. These practices included rampant unfair trade practices such as huge delay in transfer of possession to the buyer, arbitrarily changing layout plans or cancelling allotment when the price of the home increased in future. Since there were no restraints of the promoters because of the absence of a national real estate authority, they worked according to their whims and exploited the buyers. The dawn of RERA ( Real estate regulation act) 2016 appeared as the beacon of light. RERA is the most beneficial and laudable step taken by the Central Government to the plight of homebuyers. MahaRERA was one of the only few state authorities to come up with a website in the Act’s initial phase of implementation. 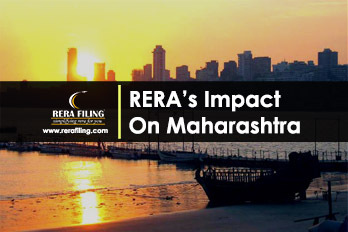 Maharashtra was one of the few states ready to implement RERA immediately after the Act was notified. Maharashtra with 16,125 projects is the state with the highest number of registered projects. MahaRERA has registered over 14000 agents under the Act. The real estate regulatory Authority of Maharashtra is also responsible for carrying out RERA registrations in the territories of Dadar and Nagar Haveli and Daman and Diu. The act brought in a precise set of norms that were made compulsory for the promoters as well as the agents to follow otherwise RERA imposes huge penalties on the promoters for not fulfilling promises with respect to the project together with providing the developers some rights against the allottee in case the allottees do not pay their dues on time. RERA is one of the finest acts passed which provides immunity to the buyers and shields them from being exploited by the mercenary promoters. With the implementation of RERA in Maharashtra, the confidence of the buyers has increased manifold since they believe that they now have an impartial body to listen to their grievances and act accordingly. Post RERA situation of the real estate sector has been vastly improved from the earlier unregulated era. Many non-serious and marginal developers have exited the real estate sector due to the stringent rules laid down by RERA and the sector has seen an ultimate boost the entire real estate sector as well as the economy. MahaRERA has made the real estate sector in Maharashtra more transparent and accountable. MahaRERA has been outstanding in abiding by the rules of the Act since it was passed, and it will be interesting to see how they contribute in further transforming the real estate sector of the State. Contact us today to register your real estate projects with Maharashtra RERA.